Marchion Williams will be sentenced Nov. 20 after pleading guilty to a charge of murder on Thursday in Allen County Common Pleas Court. Williams is facing a mandatory prison sentence of 15 years to life for stabbing Eddie McClellan to death earlier this year. LIMA — Less than a month after reversing course at the 11th hour and rejecting a deal from prosecutors, a Lima woman on Thursday pleaded guilty to one count of murder. It was the second time Marchion Williams, 40, entered a plea of guilty for causing the death of 65-year-old Eddie McClellan by stabbing him earlier this year. In early September the woman, described in court documents as “homeless,” pleaded guilty to a murder charge that called for a mandatory prison sentence of 15 years to life. 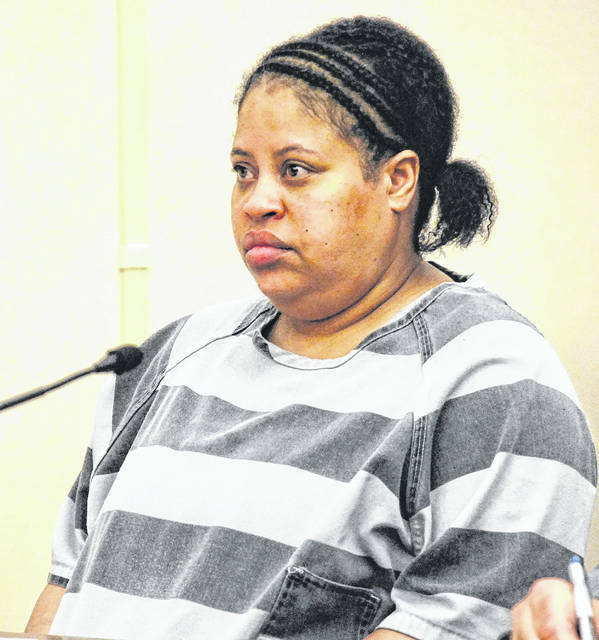 But five weeks later Williams was back in an Allen County Common Pleas Courtroom asking to withdraw her previous plea of guilty and to fire her court-appointed attorney, William Kluge. The woman told Judge Jeffrey Reed she was dissatisfied with the legal representation given her by Kluge. Attorney Greg Donohue was subsequently appointed to represent Williams. During what was scheduled as a routine status conference on Thursday, Williams agreed to plead guilty for a second time to the murder charge. In exchange for that plea, prosecutors dropped a second murder charge, along with two counts of aggravated robbery and one count of felonious assault, handed down by an Allen County grand jury in April. Williams will be sentenced Nov. 20. The charges against Williams stem from an incident that took place in March at McClellan’s residence at 605 Fairview Ave., Lima. Police were dispatched to the home in reference to a stabbing incident. Upon their arrival, officers found McClellan suffering from multiple stab wounds, including one in the chest, according to court documents. He was transported to Lima Memorial Health System where he was pronounced dead a short time later. Police later found Williams at a residence on South Union Street, a location described by one Lima Police Department detective as “a smoke house, a place where people go to smoke crack” cocaine. Williams reportedly had “a large amount of blood on her … and we found Eddie McClellan’s wallet in her pocket” when she was taken into custody, the detective said. Police say McClellan had allowed Williams to stay at his home for a few days because she was homeless. But when he asked her to leave the home, the pair reportedly began to fight. Williams admitted to police she grabbed a knife and stabbed McClellan out of anger after he ordered her to leave, according to court records.